Dorsey and Square COO Keith Rabois talk to Fast Company about their unintentional, design-driven revolution, what it means for the cash register space, the deals space, and the future of buying … everything. The new payment system that Square launched today is going to have a profound effect on how people pay for stuff in the real world—perhaps as profound as the iTunes store has had on the distribution and sale of digital media. And in the process, it will likely upend the entire payments industry. The interesting thing, though, is that it turns out founder Jack Dorsey never really planned this. His initial goals were much more modest: help people who were cut out of the mainstream payments business accept credit cards. To that end, Square’s story holds some important lessons about how entrepreneurs trying to solve a simple problem can sometimes find themselves stumbling onto a huge opportunity. Square’s origin story is well known: Dorsey’s former boss and good friend (and eventual co-founder) Jim McKelvey lost a sale for his hand-blown glass because he had no way of accepting credit cards. The problem was one many people had–the barriers to setting yourself up through conventional processes to accept credit card payments were too high for many people. So Dorsey set about seeing if he could create a better system. The result was the Square reader, which launched a year ago and which allows just about anyone to set themselves up to take credit card payments. Even you. Planning a garage sale and want to enable people to pay for your gerbil cages and Shawn Cassidy LPs by credit card? No problem. Square’s for you. But, Dorsey tells Fast Company, the company was surprised at how many businesses took to it as well, like food carts selling street food and bands selling merchandise at their shows. At the same time, Dorsey says, the iPad was emerging on the scene, providing more real estate to work with on than on the iPhone. Which got Square to thinking about a complete point-of-sale solution for businesses, rather than simply a reader for individuals. Square started thinking about receipts: Why should you get a paper receipt for a credit card–a digital–transaction? Why shouldn’t the accounting be sent to you electronically? And what about all the data that gets recorded in the transaction: What you buy and when you bought it? Wouldn’t both the vendor and the customer be interested in that data, if you could shape and present it in ways that were meaningful to each? The result is the new system. Not only are payments easier: Customers don’t have to pull out credit cards (or cash) anymore, and vendors don’t have to swipe anything. (A complete description of how it works is here.) But now both sides are also getting insights and experiences they never had before. 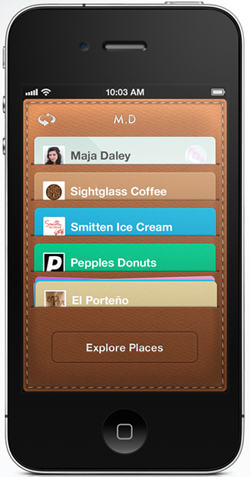 As for customers, the Square digital “card cases” they carry on their phones (pictured above) allow them to track their entire history with the businesses they frequent. Open up the case, “take out” a card, and there’s a list of everything you’ve ever bought from that particular vendor. That, Rabois says, isn’t just useful information–it actually forges stronger emotional connections between customers and their favorite stores. It’s easy to see how a system like this might appeal to both vendors and customers. And it’s also easy to see how it could become a player in the heated-up “local” space, which has largely focused on “deals” as a means of letting businesses market themselves and get new customers in the door. And since the new Square system enables some vendor content to appear on customers’ phones–for example, customers can see a restaurant’s up-to-date menu on their “cards”–the logical next step would seem to be to enable vendors to advertise deals to their customers through the Square system. Put that question to Dorsey, however, and he challenges the whole concept of deals in the first place. 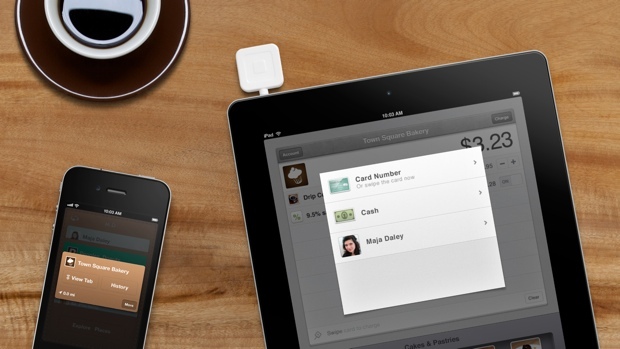 And that, Square believes, is where the real opportunity lies in the payments industry. Which is what Square has done as it has reimagined what a payments system would look like in a mobile, connected, iPhone/iPad world. And which is why, just as the iTunes store completely upended the sale and distribution of digital media, Square just might upend the entire real-world payments industry–whether it meant to or not. E.B. Boyd is FastCompany.com’s Silicon Valley reporter. Twitter[i].